We get asked often to create a sports collection. Instead of just sports balls we wanted to do something a little different. 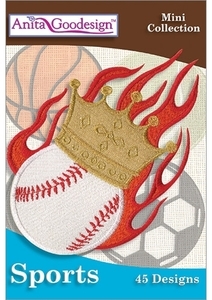 We include 7 different balls in both stitched and appliqué versions. Then we created 4 different scenes, a tribal ball, and flames with a crown, a banner and finally wing’s with a scroll. We then created a version with each of the 7 balls so you wouldn’t have to do any editing. There are also three bonus scenes included. We embroidered the football design on a draw-string bag for our project. The balls would look great on anything you stitch them on including adding them to a quilt using our Quilting Essentials collection.